This 45 is a mystery, little has been written about it in guides etc. It was even omitted from 'Fuzz, Acid & Flowers' and 'Teenbeat Mayhem'. Both sides were written and produced by Baker Knight leading me to suspect that The Power Plant could have been recordings by Baker Knight with his backing band The Knightmares but under a different guise. 'She's So Far Out She's In' has got a faster tempo than any of the other versions recorded by other groups. I'd make this version the definitive one..
Hi Colin, I have two by them - the one on Diamond 229, both sides written & produced by Baker Knight. 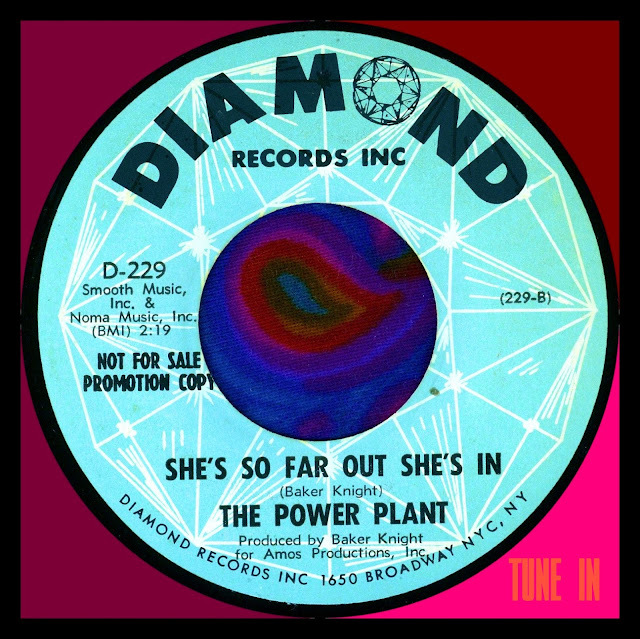 The second "Victim Of Love" / "Heavy With Me" (Diamond D-245) June 1968 is credited to Freddie May & The Power Plant and is soul. Background vocals-Dale Bobbitt (bass), Gene Holmes(guitar), & Freddie May. Recorded in 1967 at American Recording, Studio City, CA with Richie Podolor & Bill Cooper engineering/mixing. Recorded in 1968 at American Recording, Studio City, CA with Richie Podolor & Bill Cooper engineering/mixing.